THE B-MOVIE NEWS VAULT: BAD MOON rises on Blu-ray this July with lots of great extras! BAD MOON rises on Blu-ray this July with lots of great extras! ON JULY 16TH, SCREAM FACTORY GIVES ERIC RED'S "BAD MOON" A HOWLING GOOD BLU-RAY! The terrible transformation scene aside, BAD MOON is one of the better entries in werewolf cinema. It's a different kind of lycanthrope flick with a cool were-monster design, and a canine protagonist! I can't wait for this disc! Film Synopsis: Full, crescent, quarter... each is a Bad Moon for Ted Harrison (Michael Pare). By day, he's a photojournalist visiting family in the Pacific Northwest. By night, he transfigures into a horrific half-human – a werewolf. Dead men tell no tales, so Ted's sure he alone knows about his vile double life. The secret, however, may be out. The family dog Thor, devoted to defending the household, has his suspicions. Writer/director Eric Red (COHEN AND TATE, BODY PARTS) delivers a new infusion of thrills with this red blooded shocker. Michael Paré (STREETS OF FIRE) portrays Ted, hiding his accursed condition from his sister (Mariel Hemmingway - LIPSTICK, STAR 80) and nephew (Mason Gamble - DENNIS THE MENACE). What better way to hide it than to create suspicion that the local killings are the work of another – especially if that other is the family's all-too-wise German shepherd! High-definition Theatrical Cut Of The Film Plus A NEW Director’s Version Supervised And Approved By Eric Red! NEW Nature of the Beast: Making Bad Moon - Featuring Interviews With Writer/Director Eric Red, Actors Michael Paré And Mason Gamble, Special Effects Make-up Artist Steve Johnson And Stunt Coordinator Ken Kirzinger. NEW Audio Commentary With Writer/Director Eric Red (Director’s Version Only). Audio Commentary With Writer/Director Eric Red And Actor Michael Paré (Theatrical Cut). Unrated Opening Scene From The Director’s First Cut (Sourced from VHS). 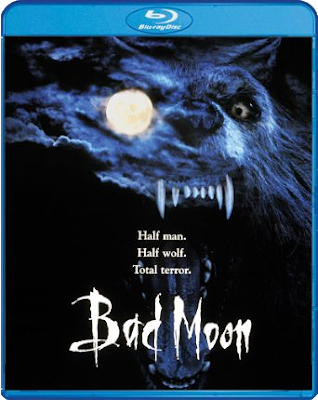 BAD MOON arrives on Blu-ray on July 16th, and is easily a must-own, if only because there's two versions of the film on this release! You can order this title directly from SHOUT! FACTORY, or from AMAZON.COM right now! Damn, I can't wait to get my paws on this disc!